A new solvothermal induced self-assembling method was investigated for the facile synthesis of SnO2/exfoliated graphite (EG) composite without any structure-directing agents. With the assistance of solvothermal treatment in an acetone-H2O mixture, ultra-small SnO2 nanoparticles of less than 10 nm could be transformed from a metastable state in colloidal solution to a highly-dispersed state on the inert surface of EG which was not acid-treated beforehand. The preparation conditions such as solvothermal time and SnO2 adding amount were found to be important factors influencing the structure and electrochemical performance of the composites. The half-sell using the SnO2/EG composite as an electrode exhibited a greatly enhanced lithium storage capacity of 910 mAh g−1 at the current density of 100 mA g−1 after 200 cycles and a moderate rate capability of 385 mAh g−1 at 1000 mA g−1. 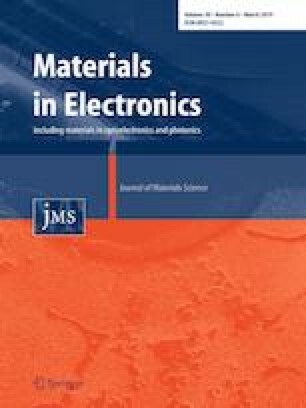 Compared with previous studies, this solvothermal induced self-assembling process supplies not only a promising anode material for newly advanced Li-ion batteries, but also a green and scalable approach for the preparation of metal oxide/carbon composites. This work was financially supported by National Scientific Research Funding of China [No. 51702191, No. 21603127], Natural Science Foundation of Shanxi Province [No. 201701D221062, No. 201801D221099], Scientific and Technological Innovation Programs of High Education Institutions in Shanxi [No. 2017110]. The authors thank the Scientific Instrument Center of Shanxi University for the Kindly Help in material characterizations.